We invite you to Wicker Park to enjoy the Wicker Park Advisory Council’s Summer Create Series, a community-produced series in collaboration with the Chicago Park District and 65 Chicago organizations. WickerICE is Community Funded and Maintained Daily by volunteers from all over Chicagoland working in partnership with the Chicago Park District. Thanks for your support of WickerICE in 2015-2016. YOUR INPUT for Next Year- WickerICE will be installed for next season in December 2016. Please view and fill out the survey to help guide us in planning next year. 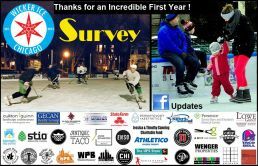 Your input will assist us with setting our hours of operation, the amounts of time allotted to family skating, adult skating, and hockey and your responses will let us know who would like to work on a committee to set up skating classes and develop a plan for skate rentals. In 2016, the Wicker Park Advisory Council Wicker Ice Committee worked in partnership with the Chicago Park District, 1st Ward Alderman Joe Moreno, WPB Chamber and WPB SSA#33 to open a new ice rink in historic Wicker Park at 1425 N Damen Ave in Chicago. The community funded and maintained non-refrigerated 60ft X 120ft rink was installed adjacent to the park’s fountain. The rink has four 4ft walls with two gates located near the sidewalk, directly east of the park’s historic fountain. The rink was installed and filled on Saturday, December 5, 2015. The 2016 season will begin with the Wicker Park Garden Club’s Fountain Decorating Social on Saturday, November 19, 2016 from 10am to 4pm. The garden club and the park’s advisory council decorate the fountain and twelve urns each November for the Winter season and invite Friends of Wicker Park to assist. All who attend the social are asked to bring finger food to share. Register for the event by contacting doug.wood@wickerpark.org. The rink will be installed on Saturday, December 3, 2016 and be open as soon as the ice freezes. The Chicago Park District’s field house will be open during the hours of operation of the rink as a warming space and for restrooms, but will be closed on holidays. The rink will be removed on March 1. The combination of the rink and the historic fountain provides numerous photographic opportunities for skaters and guests to the park during the winter season. Charitable Fund Donations from 400 individuals – Thank YOU! DEADLINE – Boo-Palooza in the Park: Monday, September 23, All Logos (300dpi color PDF or JPEG) and Activity Descriptions. 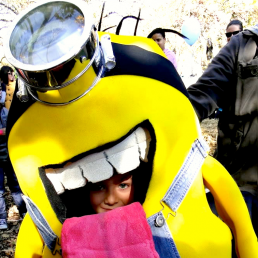 In past years, almost 2,000 attended Boo-Palooza held in Wicker Park 1425 N. Damen. The event was presented by Wicker Park Advisory Council, the WPB SSA#33, WPB Chamber in collaboration with the Chicago Park District and 60 city wide organizations. We are contacting you to ask if you'd like to join us this year. Sponsor a Prize for the Costume Contests for Dogs and Children worth $50- $100. Your business will be announced when the prizes are distributed following the parade and you can be on stage and give your prize. Man a table to represent Your Business. We ask that you offer activities for the Children at your tables and decorate them festively. Let us know what you Plan to offer- so that each table is presenting a different activity and so that we can advertise your activity! - No Charge for a 6 foot table and 2 chairs. TENTS – Let Us know if you plan to have one by 9/21. Bring your Employees and Volunteer at one of the activities. Donate food for the break room for the 150 volunteers. Your logo with link will be posted on wickerpark.org where all media and patrons are directed. If You Sponsor an Activity or Volunteer at an Activity – Your Logo will be displayed at the activity. The Banner Image with links to WickerPark.org will be emailed to 2,000 individuals city-wide each week (4x) in October. The Banner Image will be printed in color on 11X17 posters and offered to you to post in your business. All press listings will refer readers to wickerpark.org where patrons will be directed to view event details and your logo and have the opportunity to link to your website. PROMOTIONAL MATERIALS – We encourage you to have promotional materials at your tables and a banner to attach to the front of your 6ft tables. NO ITEMS CAN BE SOLD during the Event in the Park – 1425 N. Damen. FOOD & DRINK can be sampled and given away free to the public. NO ANIMALS or BOUNCY TOYS are allowed on Park District property other than dogs or cats on leash – no petting zoos allowed during the event. In Past Years these press groups have announced Boo-Palooza: The Weather Channel (Dog Parade), CBS Chicago, WBEZ Public Service Announcements, Our Urban Times, The Local Tourist, Parent's Magazine, Critic's Pick TIMEOUT Chicago KIDS, Chicago Reader, Wicker Park Bucktown Insider's Guide, Wicker Park Bucktown DNA, Chicago Park District Website, North Center – Roscoe Village Patch, Bucktown-Wicker Park Patch, WPB CC, Every Block, Kid Winks, Friends of the Parks News, WPB News, 1st Ward News, 32nd Ward News, 35th Ward News. Online registration for Wicker Park begins Tuesday, August 6th at 9:00 am. In-person registration begins Saturday, August 10th. Fall programs run the week of September 16th through the week of December 2nd. Due to the predicted snow storm, The Wicker Park Advisory Council will reschedule the public meeting to present solutions for better enforcing the Park District's Code of Conduct in all areas of Wicker Park and for all park patrons: curbing drinking, drug usage, drug sales, harassment, and vandalism. All speakers have confirmed that they will be present on March 12 for the meeting. 7:00 PM - 7:30 PM: Presentation on details of proposed solutions from 1st Ward Alderman Moreno, Patrick Levar (Park District COO), Art Richardson (Park District Central Region Manager), other Park District staff and the WPAC to better enforce the Park District's Code of Conduct in all areas of Wicker Park and for all Park Patrons. 7:30 PM - 8:00 PM: Community members to present their solutions (two minutes per person) to better enforce the Park District's Code of Conduct in all areas of Wicker Park and for all park patrons. 8:00 PM - 9:00 PM: Brief business meeting, updates and details on 2013 Events produced by the WPAC & the Community in collaboration with the Chicago Park District. RSVP to doug.wood@wickerpark.org if you'd like to present a solution. Due to weather conditions the dog park cleaning has been moved to Saturday may 5th.